The promise of the Horse Heaven Hills (H3) AVA has been extolled on these pages before. So what if this is redundant? There's good reason to honk this horn more than once. Besides, word has clearly not spread enough to price this exceptional region beyond the grasp of mere mortals. 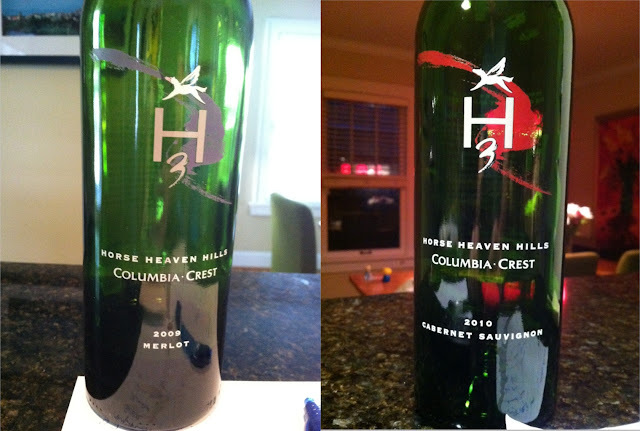 Here we have two Columbia Crest siblings sourced from H3 vineyards, one better than the next. They both share a lot in common: lush, extracted, dense fruit framed within broad-shouldered structures, and amplified by warming oak treatments. The Cab tastes like good Cab and the Merlot tastes better than most people believe Merlot should be. And based on nonscientific observation, eastern Washington is not subject to the same vintage volatility (talking about weather) as northern California. That means consistency, reliability, and the maturing of a local industry not only capable of extraordinary potential, but realizing it today.